For Californians who want to enroll in or make changes to their health insurance plan outside of the Open Enrollment Period (November 1st to January 31st), they must have a qualifying life event to do so. As of this writing, the Affordable Care Act has shortened the Open Enrollment Period nationwide to November 1st to December 15th and may be shortened for Californians as well. During this period known as the Special Enrollment Period, a qualifying life event is required to make changes to or enroll in a health insurance plan. You must enroll within 60 days of your qualifying event or else you will have to wait until the Open Enrollment Period from November 1st to January 31st (or December 15th nationwide). 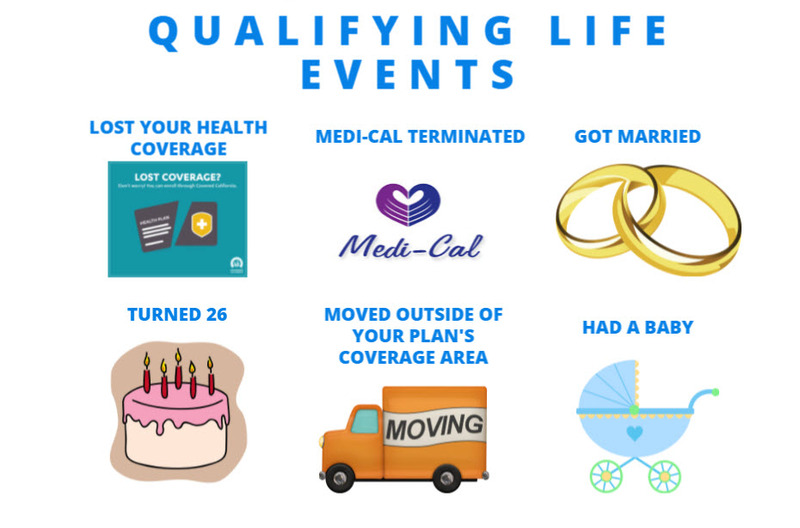 Below is a list of some of the most common qualifying life events to enroll in a plan during the Special Enrollment Period. For a detailed list of qualifying life events, review the link below from Covered California’s website. The effective date for a health insurance plan is normally the 1st of the following month if you enroll by the 15th of the month prior. If you enroll in a plan on the 16th of the month, your plan will be effective two months after. For example, if you enrolled in a plan by on July 17th, your plan will be effective September 1st. On the other hand, the effective date is subject to each insurance carrier and depends on the qualifying life event. For example, most carriers assume a newborn child’s effective date as the date of birth. For a loss of coverage due to unemployment, many carriers will allow you to enroll in a health insurance plan for the following month even if you enroll after the 15th of the month. We can review your qualifying life event and help you find a plan on or off the exchange during the Special Enrollment Period. Please contact us at Solid Health Insurance Services and we can help you figure out if your event is a valid qualifying life event, what your effective date is, and what documents are required to provide to each insurer to prove your qualifying life event. Email us for more information at info@solidhealthinsurance.com or call us at (310)-909-6135.